In this connected world where people have a variety of devices, ensuring your website works seamlessly across all of them is a need, not an option. Your website views won’t come from a single resolution device, or a single form-factor. To cater to all of them, your website needs to be responsive. If you’re familiar with responsive web design (RWD), you probably know the intricacies that come with a responsive design (and how Bootstrap solves a lot of them!). An important part of a responsive website are responsive images. 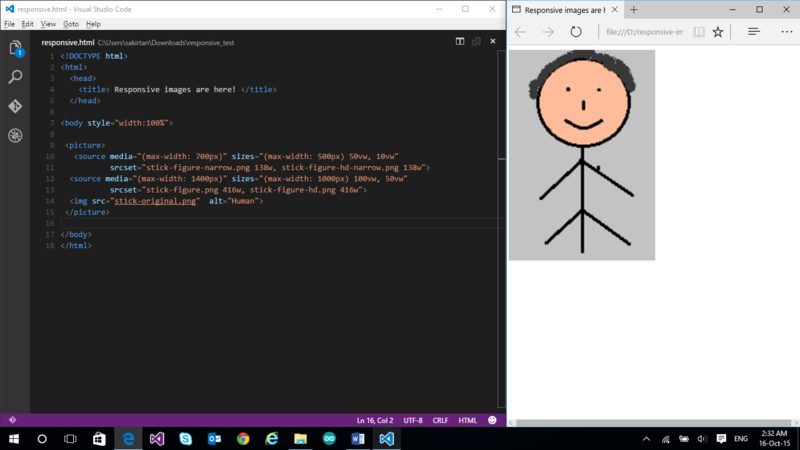 In this article, we’ll learn more about responsive images on the web and see how to build them. 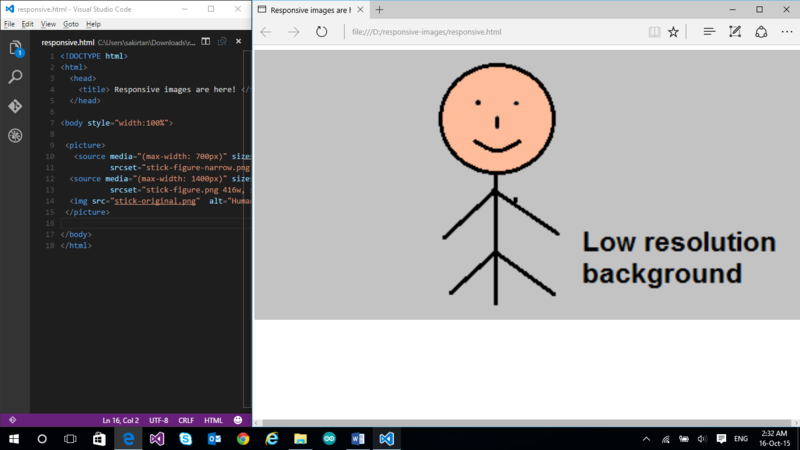 You want to show a separate image asset based on the user’s physical screen size. For example: you want to show a separate image asset on a 13.5 inch laptop and a 5 inch mobile phone (on a maximized browser). You want to show a separate image based on the resolution of the device (or, the device-pixel ratio, which is the ratio of device pixel and CSS pixel). You want to show an image in a specified image format (JPEG XR, for example) if the browser supports it, probably because of the higher compression that format supports. 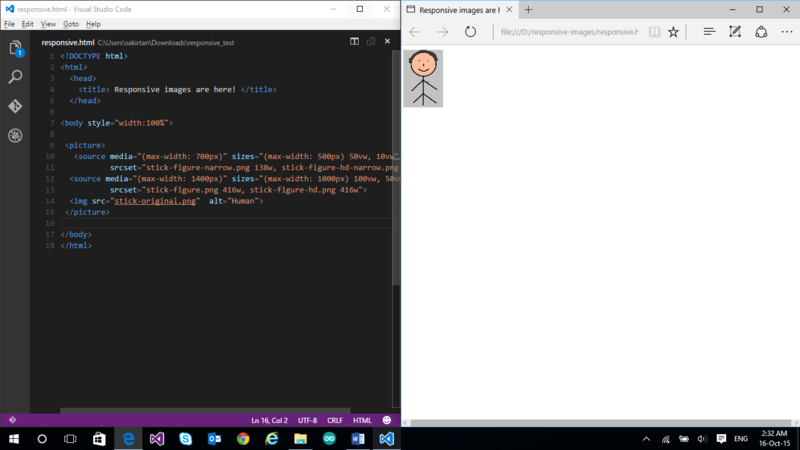 The building blocks for responsive are included in most modern browsers including Microsoft Edge (starting Windows Insider Build 10547). You can view the Web Platform status of features like srcset here. There are a number of ways to enable responsive behavior of images. One of the older methods (not recommended) is by simple scripting, but this leads to a couple of problems. One, if a script determines which image to download, but the script itself is loaded after the images specified in the HTML have been downloaded, you may potentially end up with two downloaded images. Two, if you don’t specify any image in HTML and want to load only the image as defined by the script, you’ll end up with no image at all for the browsers which have scripting disabled. Pixel density of the device (number of physical pixels per inch): A high resolution device will have a higher pixel density and hence, for the same zoom level, it will have a high device-pixel ratio as compared to a lower resolution device.For example: A high-end Lumia 950 phone would have a higher resolution than a budget Lumia 630 phone, and hence it will have a higher device-pixel ratio for the same zoom level. 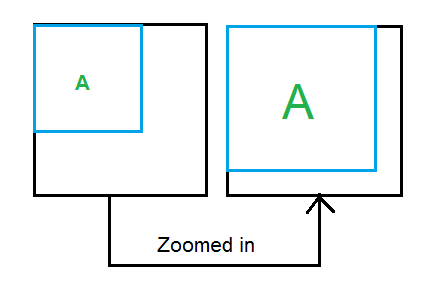 Zoom level of the browser: For the same device, a higher zoom level means more number of device pixels per CSS pixel, and hence a higher device-pixel ratio. For example, consider this figure: When you zoom in on your browser (Ctrl + Plus), the number of CSS pixels for your div remains the same, but the number of device pixels it occupies increases. So, you have a higher number of device pixels per CSS pixel. for a device-pixel ratio of 1, the image space-needle.jpg will be used. for a device-pixel ratio of 2, the image space-needle-2x.jpg will be used. for a device-pixel ratio of 3, the image space-needle-hd.jpg will be used. src attribute is used as a fallback for the browsers which do not yet support srcset implementation. This works well. Using the x descriptor, you’ll always get the same image on the devices with similar device-pixel ratio – even if this means that you get the same image on a 13.5 inch laptop and a 5 inch mobile phone which have the same device-pixel ratio. Now suppose we want a different size (height, width) image on a larger or smaller viewport. This is where the w descriptor in srcset and a new attribute – sizes comes into play. So, for a 1.5x display, images/space-needle-2x.jpg will be downloaded by a browser, since it gives a device-pixel ratio of 1.6x (which is most suitable for a 1.5x display). <img src="images/space-needle.jpg" sizes="(max-width: 40em) 100vw, 50vw"
Similar to above, the browser will decide which image to pick from above for a specific display. For a viewport which is 41em wide, (max-width: 40em) evaluates to false, which means 50vw, that is, the image is half as wide as the viewport. I want the same image to be displayed across all devices, but I want to display it in a higher resolution on devices which can support it. The height and width of the image should remain fixed. Make multiple assets of the same image (space-needle.jpg, space-needle-hd.jpg). Use srcset with x descriptor. I’m doubtful that if I use the same image for a smaller screen size, the primary subject of my image may become too small in size. I want to display a different image (more focused on the primary subject) in a different screen size, but I still want to display separate assets of the same image based on device-pixel ratio, and I want to customize height and width of the image based on viewport. ? The solution to ‘?’ is picture element! The first source element whose media attribute’s media query holds true is chosen. So, if the max width of viewport is 20em, the corresponding image source is selected from the images/small directory, based on the device-pixel ratio. All the images within one srcset are usually multiple assets of the same image. The picture element itself does not display anything. Even the source element within the picture element does not represent anything of its own. The source element must contain the srcset attribute and it may have sizes, media and type attributes. It’s necessary to add img element within picture. You won’t see any image without the img element. All the source elements within the picture element are just there to feed the image a source. When it is used, both the attributes: media attribute and the type attribute should resolve to true for that source element to be chosen. If the browser can’t understand any of the formats, it falls back to img. 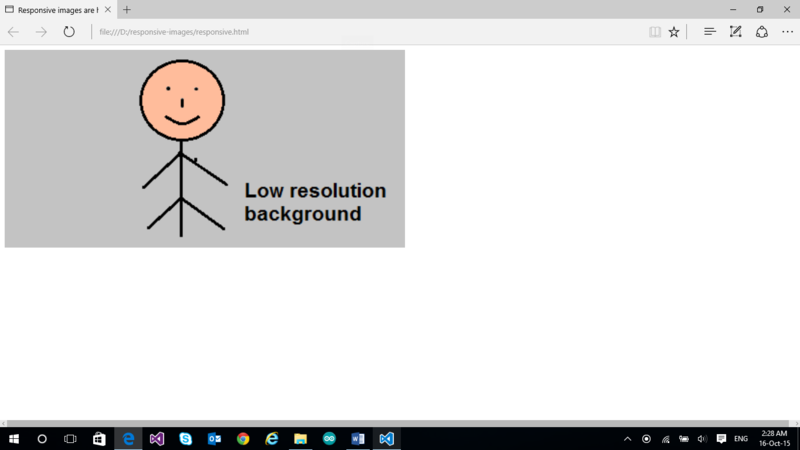 After understanding how responsive images work, let’s look at a complete example which utilizes all the three together – srcset, sizes and picture. <source media="(max-width: 700px)" sizes="(max-width: 500px) 50vw, 10vw"
<source media="(max-width: 1400px)" sizes="(max-width: 1000px) 100vw, 50vw"
In this example, we’ve used picture which contains multiple source elements. The first one is chosen if the max width is 700px. If this is chosen, the sizes attribute then decides the size of the image to be displayed based on the width breakpoints we have mentioned. The implementation is exactly similar to what we have seen in sizes attribute. So, if the max width is 500px (width ranges from 0px-500px), the image will occupy half of the viewport. And the image source is chosen based on the device-pixel ratio. However, if the viewport width is greater than 500px (but <=700px, because we are within the first source element), then the image will occupy just 1/10 of the viewport. Responsive images give you, the developer, an option to give the best experience to your users across the multiple devices they use to view your website. It’s a good time to start integrating it into your website if you haven’t yet. I hope you had fun reading this! Reach out to me on Twitter if you want to discuss more!